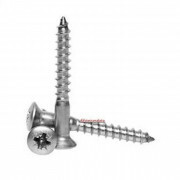 Woodscrews are normally a steel screw used to clamp items onto wood, chipboard, MDF and wood pulp based materials; tapping their own mating thread generally into a pilot hole as they are installed. 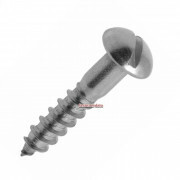 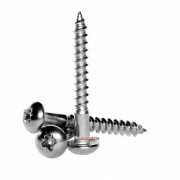 Wood screw generally has a partially unthreaded shank below the head, the unthreaded portion of the shank is designed to slide through the top board, closest to the screw head, in order that it can be pulled tight to the board to which it is being attached. 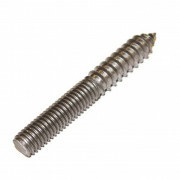 Wood screws have an internal drive, traditionally slotted but currently and far more commonly a Pozi® or Phillips® drive; in Canada square drive recess is also available, preferred by some users when manually driving screws for its secure fit to the drive bit. 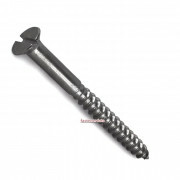 Wood screw threads are tapered to a Gimlet sharp point; screw development has allowed the introduction of points that reduce the potential for splitting the wood and allow assembly without a pilot hole. 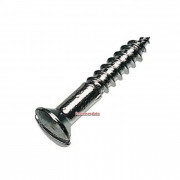 Traditional wood screws with a conical point represent a small element of the market and are used in historic furniture applications.